Cover artists Dhrupod & Poshla with Saima Hossain at the launch of Unique Glimpses. DHAKA, Mar 29 2018 (IPS) - Shuchona Foundation is a not-for-profit policy advocacy, research, and capacity-building organization specializing in neurodevelopmental disorders (NDDs) and mental health. It is the culmination of the efforts to coordinate and mainstream policies and programs for mental health and NDD’s that began with the launch of the of the GAPH-Bangladesh in 2011. Shuchona’s work is geared towards creating a productive and meaningful life for persons with any disabilities as included – not just integrated – members of society. As a low density-high impact entity, Shuchona’s aim is to foster innovation in the area of neurodevelopmental disorders and mental health; enable inclusion in social, economic, political and cultural progress; and mitigate the myriad challenges faced by persons with disabilities. Shuchona Foundation acts as an effective bridge between national and international researchers, policy makers, service providers, and persons with neurodevelopmental disorders and their families to promote inclusion worldwide. Shuchona Foundation’s work cuts across every tier – from instituting policy framework to sensitivity trainings. The work is grounded on Shuchona’s core vision – that of enriching society with a universal support system and environment for persons with any disabilities to lead productive and meaningful lives in mainstream society. 2017 was a dynamic year for Shuchona, beginning with the launch of the book Unique Glimpses on 4th April at the International Parliamentary Union Assembly in Dhaka, Bangladesh. 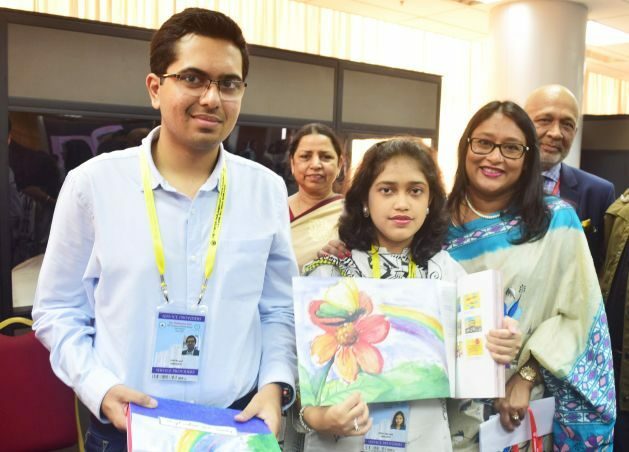 The book edited by Saima Hossain showcased a powerful collection of artwork done by young artists on the spectrum from 2007-2015 that had been submitted to the Prime Minister’s office. Many of the artworks were subsequently awarded and used in the printing of the Prime Minister’s official greeting cards. The covers of the book were done by 2 young artists on the spectrum and contains a forward by the HPM Sheikh Hasina. On 19th April 2017 Shuchona organized a 3-day International Conference on Autism & Neurodevelopmental Disorders at the Royal Banquet Hall, Thimphu, Bhutan co-hosted by the Ministry of Health of both Bhutan and Bangladesh with technical support from WHO-SEARO and Ability Bhutan Society. Based on the theme ‘Developing effective and sustainable multi-sectorial programs for individuals, families and communities living with autism spectrum disorder (ASD) and other neurodevelopmental disorders (NDDs)’300 participants from 31 countries engaged in thematic panel discussions on community-based services about early identification, interventions,education,employment and ensuring rights &supported independent living. The inauguration was graced by the presence of HM The Druk Gyaltsuen, Jetsun Pema Wangchuk as well asthe Prime Ministers of both Bangladesh and Bhutan, Regional Director of WHO-SEARO along with ministers of health, education and social welfare from around the region. Professionals, parents and self-advocates on every panel ensured a dynamic and insightful discussion took place in the presence of policymakers and international development organizations. 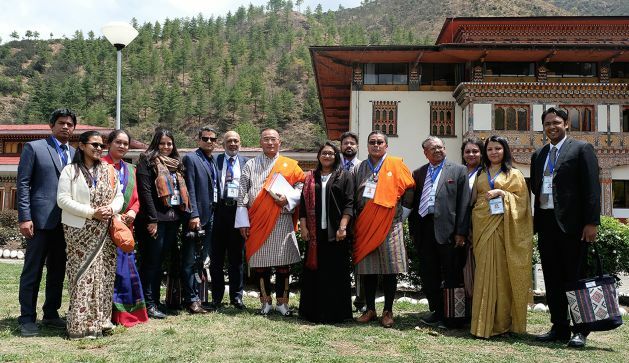 The conference culminated with the launch of WHO’s Southeast Asia Regional Collaborative Framework on ASD and the adoption of the Thimphu Declaration. Shuchona Foundation has developed a training program for the Ministry of Women and Children’s Affairs (MoWCA)on research-based information to enhance social and communication skills in children under 7 years of age which can easily be implemented at home and day-care centres. On June 14th 2017 this project was launched which will not only enhance development but would also lead to early identification of developmental delays and ensure that young children receive the assistance they need when they need it the most. The Department of Disaster Management, Ministry of Disaster Management and Relief, in collaboration with the Centre for Disability in Development and Shuchona Foundation, organized a training on ‘Strengthening the capacity of crisis responders on addressing mental health issues within crisis preparedness and management’ in August 2017. The training, for which a research-based manual has been developed, have been received by professionals from different ministries, national and international NGOs, and other organizations who work in the field of disaster management. Shuchona Foundation is developing a comprehensive employment training program for persons with ASD in Bangladesh, in collaboration with Centro Ann Sullivan del Perú (CASP). Shuchona has been providing sensitization sessions to interested employers in diverse industries such as, leather manufacturing, apparel, IT and creative agencieson the benefits of employing persons with ASD, and the different ways in which it can be done. Through this supported employment program, Shuchona aims to help create better and more diverse job opportunities for persons with ASD in Bangladesh. A 3-year pilot project on ‘A comprehensive approach to identify children with disability through capacity building of government and NGO health workers and disability service mapping in Bangladesh’ was formally launched in February 2018. This project is a collaboration between ICDDR,B, FAITH Bangladesh and UNICEF, and as technical advisor Shuchona Foundation is responsible for the design, selection of experts, technical components and training of experts. The project assesses feasibility of disability monitoring screening and referral to specialized intervention programs based on rural and urban settings. In February 2018, Shuchona Foundation initiated a pilot program for the training of the school teachers for inclusive education. Currently being implemented at 2 private schools we hope to better understand the effectiveness of the training program and its efficacy in both low and high resource schools. This is an attempt to support teachers in developing and expanding their own capacities to facilitate and support learners with diverse needs; help teachers become better at teaching all students together regardless of their abilities, disabilities or background of experiences. The training manual that has been developed based on the most current research on learning is currently being translated into Bangla. Shuchona Foundation in line with its mandate of capacity building, has started providing technical training to professionals on various pertinent topics including a Foundation Course on ASD, Behavioural Interventions, Inclusive Education, Guide for Monitoring Child Development, Autism Diagnostic Observation Schedule and Parent Skills Training.